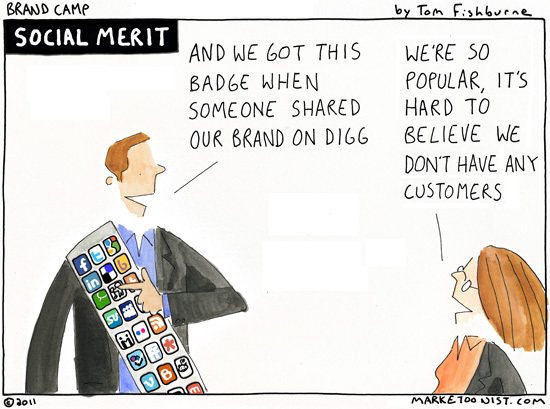 Social badges are not merit badges. Yet many brands treat social media as checking a box, rather than making a commitment. There’s a “Like grab” underway to accumulate as many friends, fans, followers, and likes as possible. Social proof is not necessarily proof of quality. It’s easy for brands to feel encouraged as a campaign generates a few hundred or thousand new “likes”‘ but what do those likes really mean? There’s a campaign mindset to much of social media that prizes quantity over cultivating quality relationships. Against this confusing backdrop, Joe Hernandez founded Klout to help provide a “standard of influence”. Klout scores social influencers in an effort to provide a quality lens to social media. Reward for effort, ultimately if you aren’t turning the ‘likes’ into cash how are you justifying charging the time? Coming from the old camp of direct marketing, this is not a new question to us. What do you do with all the names that you’ve collected from the holiday prize draw (or sweepstakes depending which side of the pond you come from). The simple answer is to use the ‘data’ to build insight and a customer base. Building insight – I would have given my right arm back in the day (we’re talking a couple of years max) to know so much about my customers. With one like button there’s an entire research survey of information. Use it, it’s worth thousands. Building a customer base – Admittedly a flunky badge isn’t going to get the dollars floating out of my wallet. But using the insight you’ve gained to tailor your messaging has to be one of the ways to go. I don’t mean in a big brother way, I mean using segmentation to inform. 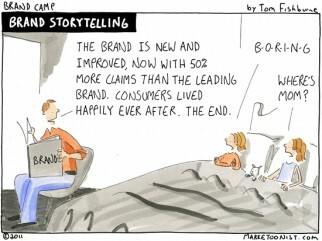 Tom – Great cartoon once again that squarely hits on what is going on in the halls of brand marketers everywhere. Brand Managers are by nature a competitive bunch. We live in a world that is measured by 1/10 of a point increases in dollar share on a weekly basis. 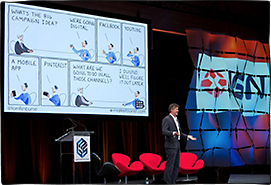 So its not surprise that we’re seeing a bit of one-upsmanship when it comes to digital and social media. If Brand X has 1MM fans, doesn’t it mean I’m doing better if my Brand Y has 1.5MM fans? Everyone is learning that isn’t necessarily the case but at least the drive for social (and digital) merit badges is driving use of the tools. 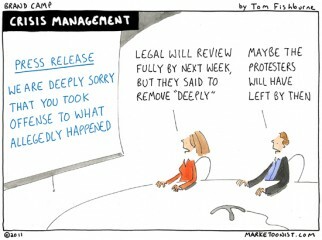 Now we just need to uncover the best practices once we’ve tried the tools. Really like the sentiment here Tom. A land grab is indeed in place and has been for a while. What many businesses and brands and the people within them don’t realise is the level of planning, work and on-going adaptation required to make real use of the ‘badges’ they are collecting. 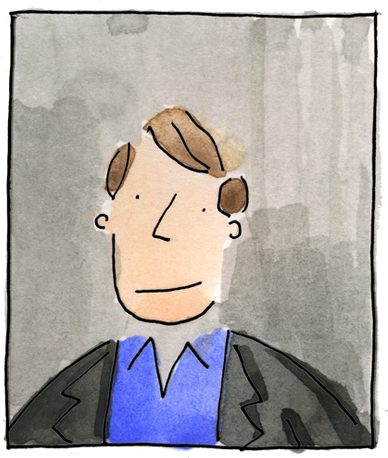 Too many badges can lead to a confused and mislead strategy that benefits neither the business or the customer and stakeholder. Tom: Love the like grab reference. We tell folks that social media is a committment and not a campaign. That helps us walk through a discussion that goes something like this. 1) Social media is an engagement strategy, not a broadcast strategy. 2) We can use paid media to acquire likes, but if you don’t have an engagement strategy (EARNED media) underway first, it’s wasted money. 3) If you are part of the like grab, and you win (by your measures) without having an engagement strategy in place? It’s like dialing the phone, laying it down on the table and walking away. You have everyone’s attention now and you act as if you’re “done” with this campaign? Reminds me of the early days of segmentation when those who didn’t understand the tool wanted to appeal to all segments! One thing we know for sure, it all settles over time. Love the power and the story you tell in one image. We the commenters, take paragraphs. Does Klout provide a quality lens? Klout is interesting, and it’s great for an ego-boost/reality-check, but it doesn’t really help my clients discuss or improve their social media goal conversion (from accumulating fans to actually making the sales). I always tell clients that social media ROI is about quality rather than quantity, but Klout uses quantity to measure quality. I’m a communications strategist at a boutique brand house and I’m amazed by how difficult it is to find useful resources that address social media goal conversion and discuss social media in concrete ways that actually help my clients improve the effectiveness of their efforts. Here are a few blogs I’ve written to meet the need, has anyone else found or created a few they’d recommend? So right. Overheard in more than one meeting: “We need to put Facebook and Twitter on there” and “Let’s do something with a QR code.” When did this become all about sharing and no longer about what was bing shared? I have had so many customers and colleagues talk about wanting to make social media more prominent on the websites, include more forms of it, with more little buttons for users to click. Yet none of them have any quality, recurring content. It’s tough enough for it to mean much with good content. And being on 100 social media sites in name only is far worse to me than being on just one social media site and doing it well. Great post! This underscores, I believe, the opportunity for marketers (entrepreneurs, brand managers — anyone using social media to promote business/self) to reconsider: what’s your intent? Are we sincere in the desire to connect with people to collaborate and create value through relationship? Or do we really just want the sale? If we come to “social” media with an anti-social, push-marketing agenda and mindset I think we’ve missed the point. In fact, we may be missing out on the joy of living life too. Lots of badges, but a mighty sad and empty reality. Isn’t this exactly what many of us hoped to leave behind in our corporate cubes? Wow, awesome commentary everyone, thanks! I learned a lot this week from you. I particularly like Kevin’s analogy of neglecting an engagement strategy to placing a telephone call and putting the phone down the moment someone answers. 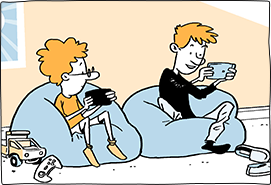 This week’s cartoons go to Kevin Dugan (on the blog) and David Leavitt (on Facebook). Cartoons are on the way.